Pioneers in the industry, we offer veterinary uterine tonic from India. The Veterinary Uterine Tonic formulated by us is available in900 ml contents. This range of medicine is used as supplement which complete Utrine Tonic and Ecbolic. This medicine id formulated with several minerals and herbs. 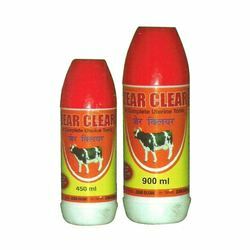 It is regarded as the best supplement of all kind of animals. We also conduct various quality tests on the supplements to deliver a defect-free range of medicines to our customers. Each 450 Ml. Contains: Niacinamide, Copper Sulphate Mangnese, Mag. Sulphate, Zinc Sulphate, Iron, Calcium, Folic Acid, Vitamins & Fortified With Herbs. Ashok Chaal, Ulat Kambal, Methi Beej, Gajar Beej, Mooli Beej, Molsari, Dashmool, Pipla Mool & Adrak Powder. Looking for Veterinary Uterine Tonic ?